The Cobra MR HH500 is a long range walkie talkie specifically designed for marine use. It is sturdy, and upon first impression definitely looks like it can take the rough weather conditions someone could find themselves in when they are a few miles off the shore. The MR HH500 has a large illuminated backlit screen, and backlit keys, making it easy to operate in the dark. The walkie talkie is lighter than we have expected, and incredibly easy to handle. The MR HH500 is great for water based activities, because not only is it waterproof, the walkie talkie is completely submersible and able withstand over 30 minutes underwater. 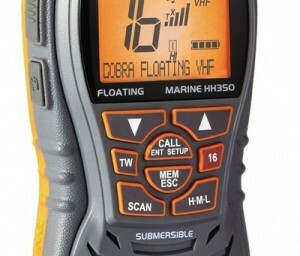 To make retrieving it easier, the walkie talkie also floats, and with the bright orange colors along it’s side, the MR HH500 is easy to find on the surface of the water, should it be dropped overboard by accident. The waterproofing really is everything you could wish for when you go on water based activities like boating, fishing, kayaking or rafting. The Cobra MR HH500 comes with Cobra’s BURP feature, which quite literally vibrates water out of the mouthpiece after taking it out of the water, making sure you can use the unit right away. 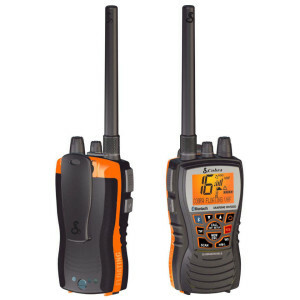 Another remarkable and great feature which makes this long range walkie talkie ideal for marine use is that you can link your mobile phone wirelessly via bluetooth. This means that you can store away your mobile phone in a safe and waterproof place, yet you are still able to receive and make phone calls. We’ve heard many people mention how great this feature is when kayaking. Costumers place their phones in waterproof bags deep in the kayak and don’t have to worry about it getting wet whilst receiving phone calls. This would have been terrible if we didn’t go into it’s performance completely. 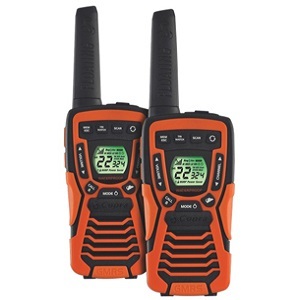 The Cobra MR HH500 walkie talkie has a long range of up to 20 miles. As always, this maximum range is under perfect circumstances which you might not be able to reproduce. 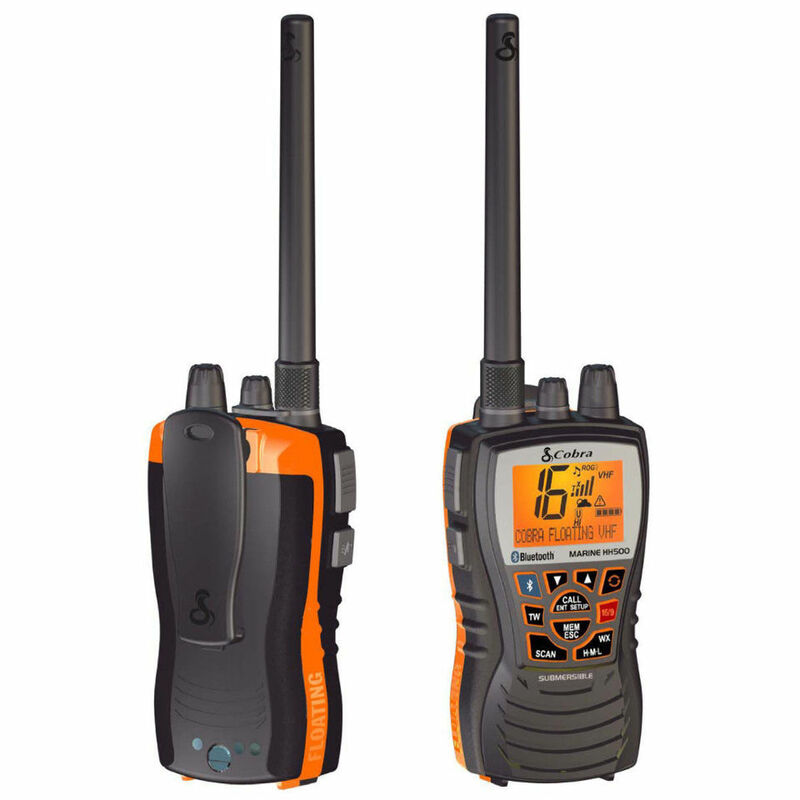 We have taken these walkie talkies offshore on a boat and found that on the open water we were able to get over 5 miles on the highest wattage use(more on this later) without any problems. We found the sound quality of the Cobra MR HH500 to be one of it’s main talking points. We were amazed by how clear the sound quality was. The MR HH500 has a noise cancelling microphone, which makes you easier to understand too. We’ve all been in that situation where we’re trying to understand what someone is saying, but the wind blows into the receiver and what’s being said it indecipherable. With the noise cancelling microphone, you will know that this will not happen when you speak. In case for whatever reason you do miss what was said, perhaps because you didn’t understand what was said, or simply because your walkie talkie was a little further away than usual, the Cobra MR HH500 has a Rewind-Say-Again™ feature which lets you replay missed VHF calls. This feature works pretty much like a voicemail and you can always play back the last 20 seconds of transmission. 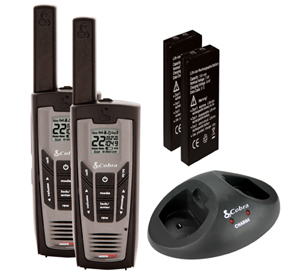 The long range walkie talkie has a selectable 1, 3 and 6 watts power setting for short to long range communication. At it’s lowest setting the distance of communication will be shorter, but the battery life will be much longer. Additionally, there is no excuse to ever run out of battery while operating this walkie talkie as it comes with a second battery pack, a charging dock, and wall and vehicle adapters included. Between the two battery packs, your time online should be easily over 5 days, even when you use your device a lot. The Cobra MR HH500 comes packed with many more both expected and unexpected features. The walkie talkie comes with all USA, Canadian and international channels and features NOAA weather channels as well as receiving weather alerts. When you’re out at sea, the weather can change within minutes from being a lovely bright day to being a right thunderstorm. It’s very important to be prepared, and the MR HH500 helps you with that in any way possible. Another very useful added feature when it comes to safety is the tri-watch scan. This walkie talkie has the ability to scan three channels at once. This can be particularly useful for monitoring Channel 16 (distress, safety & calling) and a weather channel, along with your groups channel. This way, you get all information that could be relevant to you, and don’t miss anything on your own channel at the same time. 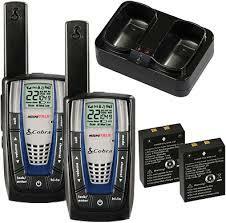 We can conclude this Cobra MR HH500 review by saying that the Cobra MR HH500 is a state of the art walkie talkie. It’s specific use does not stop at water based activities, but it certainly is where it shines. 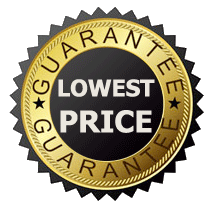 It is competitively priced and has everything we wish a long range walkie talkie would have. The walkie talkie has some great unique features and the combination of it’s great sound quality, the Rewind-Say-Again™ feature and the ability to withstand any extreme weather condition make this our best walkie talkie we reviewed. I received these in the mail yesterday, and charged them overnight. The next day I was a little skeptical whether or not they would function properly. They both work perfectly, and the sound quality is great. It is also nice because the radios have just the right amount of functions. You can get done what you need to, withought being dragged down by an insane amount of worthless functions. I tested them today and I was able to get a mile and a half range out of them while I was in my house and my sister was in a car. We were both in a city and it was rainy (I actually don’t know if rain would affect it). On the box Cobra states that you can get 35 miles on a mountain (with perfect conditions), 17 miles in a forest, and 3 miles in a city. Overall this is definetaly worth its price. Great buy. Hi , i need to buy 8 units for the BOAT WHICH IS located in Mediterranean sea , the order to ship to Paris , and the chargers to be European plug and cycles , also required 8 Pcs ear and Micro in one piece if possible in blue tooth if possible .